It was during a summer course in 1907 that Hammershøi painted this forest image in Trørød north of Copenhagen. As opposed to the artist’s open landscapes, such as Tuesday Forest and Sun Rain. Gentofte Lake in which focus is transferred from the foreground to the middle ground, from what is near to the semi-distant, in this painting he draws our attention to the shrubby young forest of the foreground. In addition he points out a way into the composition in the form of a forest path in the right side of the picture – a very unusual feature for a landscape painting. 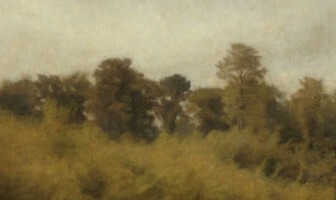 The painting is also unique in its monochromatic and blurred interpretation of the forest motif, which with its impalpable light and diffuse texture presents the forest area as a world without references despite the designation of place in the title.